The ProcessPower UPS from Solidstate Controls is a true, on-line, double-conversion uninterruptible power supply system that provides clean, regulated, continuous power for critical AC loads. 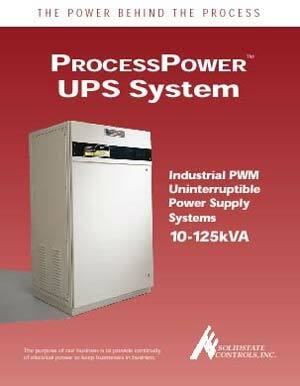 Designed specifically for process control and other industrial applications, the ProcessPower UPS utilizes state-of-the-art PWM technology incorporating high power IGBT semiconductors. The ProcessPower UPS includes advanced communications capability, along with a high resolution LCD graphics display interface panel for complete system status, including alarms, and voltage and current parameters. A keypad is used to operate the panel and permit selection of functions. Alarm panel operation is also possible if the primary fails. AMETEK Solidstate Controls, 875 Dearborn Dr, Po Box 1249, Columbus, OH 43085. Tel: 614-8467500; Fax: 614-885-3990.